You're gonna LOVE this Silhouette Portrait 2 Starter Bundle for $139.99 (Retail $269.99) - valid 3/16 only or while supplies last. -The Silhouette Portrait is an electronic cutting machine for personal use. -The Silhouette Portrait 2 features Bluetooth technology (US, Canada, EU only) and is compatible with Silhouette's new AutoBlade. -The machine also has the ability to register and cut printed materials. -Like a home printer, it plugs into your PC or Mac® with a simple USB cable. However, instead of printing, it uses a small blade to cut paper, cardstock, vinyl, fabric, and other material up to 8 inches wide and 10 feet long. 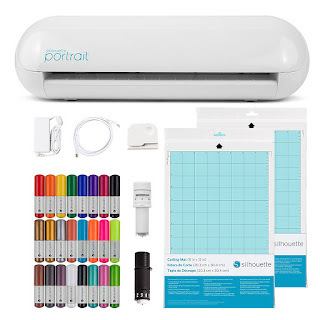 -Includes Silhouette Portrait 2 Cutting Machine with power cable, USB cable, Bluetooth adapter, 2 of the 8" cutting mat, AutoBlade, Ratchet blade, 50 digital cuttable designs, 24 pack sketch pens, Silhouette Studio Software, and One-month free subscription to the Silhouette Design Store.